The American singer was awarded the prize for “having created new poetic expressions within the great American song tradition”. BOB DYLAN HAS won the Nobel Prize for Literature. The 75-year-old is the first songwriter to win the prestigious award after an announcement that surprised prize watchers. 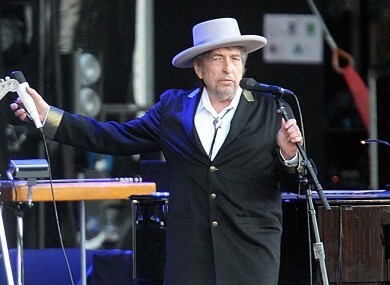 Sara Danils, permanent Secretary of the Swedish Academy called Dylan a “great sampler”. She praised his seminal Blonde on Blonde album. “An extraordinary example of his brilliant way of rhyming. putting together refrains, and his pictorial thinking. “If you want to start listening, you may start with Blonde on Blonde. Asked whether she had spoken to him today, Danils said she hadn’t, but would speak to him this afternoon. She said she was not afraid of the notoriously gruff folk singer. Dylan becomes the 259th American to have won a Nobel Prize. Email “Bob Dylan wins Nobel Prize for Literature”. Feedback on “Bob Dylan wins Nobel Prize for Literature”.